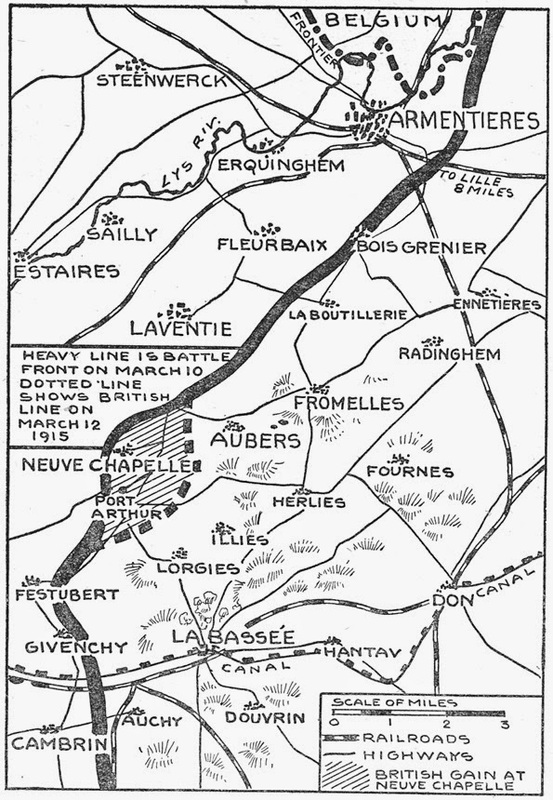 - At 730am this morning, British artillery opens up on the German line at Neuve Chapelle. The intense bombardment, using more shells in thirty-five minutes than the British had used in the entire Boer War, catches the Germans completely by surprise. The concentration of shells against such a small portion of the line ensured that most of the German defensive positions were obliterated, while the brevity of the bombardment left the Germans with no time to send up reinforcements, leaving the defenders significantly outnumbered. When the attacking infantry go over the top at 805, they easily break through the front German trench while the German survivors break and retreat. The pace of the British advance is set not by German resistance, of which there is practically none, but rather how fast they can move over the ruined battlefield. In thirty minutes, the British have captured the village of Neuve Chapelle, and the entire of the first objective line is soon in British hands. The battle of Neuve Chapelle, March 10th to 13th, 1915. 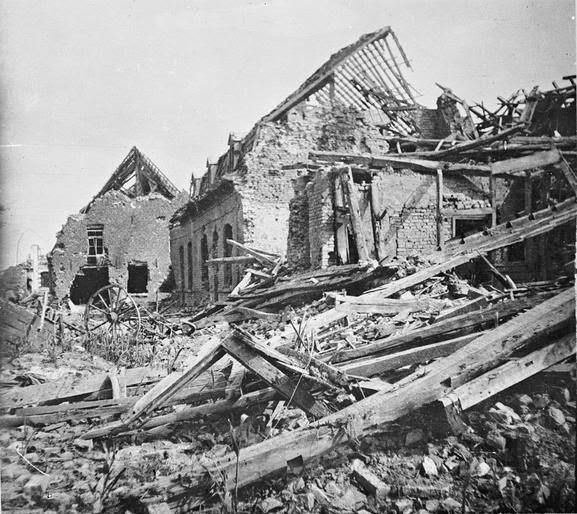 The ruins of the village of Neuve Chapelle after its capture by the British, March 10th, 1915. By noon the British have achieved the goal that has and will elude so many other attacks on the Western Front - a breakthrough. The German line has been shattered, and there is nothing before the British infantry but fleeing Germans. It is a success that exceeds even the expectations of Haig and his staff. However, this breakthrough leads to the accomplishment of absolutely nothing of significance, and the reasons point to fundamental realities that hinder offensive operations on the Western Front for most of the war. Most important is actually a technical limitation: while wireless radios have been developed, they have not yet been miniaturized enough to allow for sets to be carried by infantry into battle. Thus advancing infantry have only two options for communicating to rear areas: (1) telephone lines; and (2) messengers on foot. The first requires the laying of telephone wires that are extremely vulnerable to enemy artillery fire, while the latter, even if they can escape the front line alive, are greatly slowed by the destruction omnipresent on the battlefront, and hours frequently pass between the departure of a messenger from a front line officer to his arrival at a headquarters in the rear. As a result, it is practically impossible for officers commanding advancing infantry to communicate their position, which in turn has two consequences. First, it means that artillery batteries fire without knowing the location of their own infantry, which creates the very real potential for friendly fire and prevents the infantry from ordering artillery fire on unexpected defensive positions they encounter as they advance. Instead, the infantry is expected to advance at the pace of the pre-arranged artillery barrage, as it moves from the first to the second to the reserve trench lines. Move too fast, and the infantry run the risk of literally running into their own artillery fire. Second, it means that when the advance does not go to plan, forward officers are unable to receive revised orders from their superiors. Thus when the pre-battle plan fails to provide instructions for the actual circumstances on the battlefield, forward officers default to doing nothing, lest they either create chaos by random advancing and/or march their soldiers into a future artillery target. This is not to condemn these officers, having to make difficult decisions often under intense enemy fire and with their units significantly depleted; it is little wonder that they default to their training, which is in such conditions to wait for further orders. The problem, of course, is that as they wait, the enemy has a window in which they can rush in reinforcements and plug the breach in the line. Thus even when attacking forces are able to achieve a breakthrough, it disappears like a mirage, ever just beyond reach. This is precisely how the breakthrough at Neuve Chapelle plays out. When the British infantry reach their first objective line ahead of schedule, they halt their advance, awaiting further orders. The Germans, meanwhile, rush up reserve formations to plug the gap, and are able to do so largely unmolested by artillery fire. In addition to the lack of direct communication between British batteries and their infantry, air-ground artillery coordination has also failed; despite the infantry carrying white stripes of cloth to mark their position, mist obscures them. By the time the British are finally prepared to resume the advance at 530pm, they find new German reserves in front of them, and they are halted halfway between Neuve Chapelle and Aubers Ridge. By the end of the day's fighting, the strategic opportunities available in the morning have vanished, and further attacks will need to be launched against forewarned and reinforced German defences. 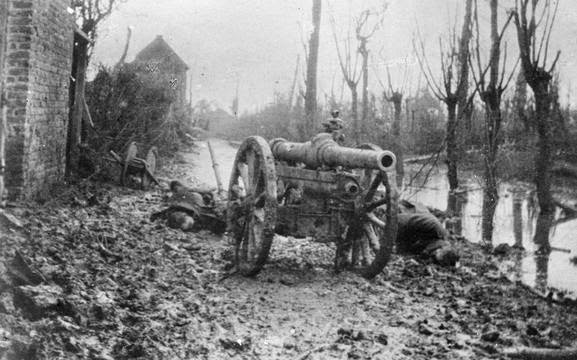 2.75 inch mountain gun near Neuve Chapelle, March 10th, 1915. - Despite the abject failure of test use of gas at the Battle of Bolimów in January on the Eastern Front, the German army continues to view the weapon as potentially significant. The first asphyxiating gas to be produced in quantity was chlorine, chosen because it did not require the diversion of any resources or manufacturing capacity from the munitions industry. Though a shell has also been invented that can carry and disperse gas, they are not yet available in sufficient quantity to make their use effective. Instead, the tactic at present is to mass thousands of canisters of the gas along the front line, and open them when the wind will push the gas in the desired direction. As its use was totally dependent on the weather, it could not be used in major pre-planned operations that required precise scheduling, as with the preliminary discussions at OHL regarding an offensive on the Western Front. Instead, Falkenhayn has decided that the execution of the first major gas attack will be assigned to 4th Army, responsible for the front in Flanders. The focus of the operation will be primarily on testing the combat effective of large-scale use of gas, while crucially the gains on the battlefield itself are a secondary consideration. 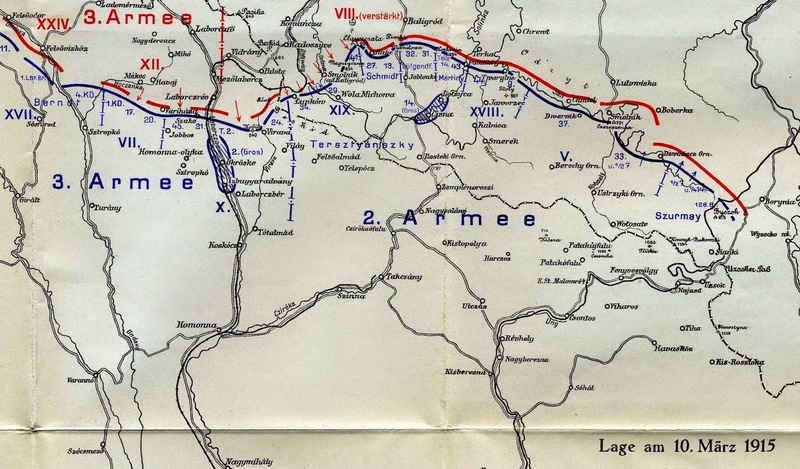 4th Army headquarters has decided that the attack should take place on the southeastern face of the Ypres salient, between the Ypres-Comines Canal and the Menin road. XV Corps has been assigned to undertake the assault, and as of today the gas canisters have been installed on six thousand yards of the line. Now it is simply a matter of waiting for the right weather conditions. - The German navy loses two submarines today: U-12 is rammed and sunk by the British destroyer Ariel off the Scottish coast, while U-29, whose captain had famously sunk the 'live bait squadron' off the Dutch coast in September, is rammed and sunk by Dreadnought while attempting to line up a torpedo shot at the dreadnought Neptune. The two losses highlight that the only reliable means the British have of sinking U-boats is to destroy them at the surface. As of yet, no means exists to sink a submerged submarine. - Even in the context of a terrible winter in the Carpathians, a particularly heavy blizzard strikes today. In these conditions movement is impossible; the sick and wounded die as they cannot be evacuated, while entire skirmish lines vanish into the snow. The Austro-Hungarian infantry find it impossible to dig entrenchments, and have to huddle in the open in front of the Russian positions they are supposed to be attacking. In the eastern Carpathians, the blizzard forces Generals Pflanzer-Baltin and Brusilov to postpone their respective plans for offensive operations. The position of the Austro-Hungarian 2nd and 3rd Armies in the Carpathians, March 10th, 1915. - In London, unbridled optimism still reigns regarding the Dardanelles operation, and the War Council discusses today what the British should do after the fall of Constantinople- Kitchener, for example, calls for an attack on Alexandretta. There is little appreciation as of yet of the difficulties encountered at the Dardanelles, where tonight the minesweepers make their seventh attempt. To improve their chances of success, they use a new approach: instead of sweeping while sailing up the straits, they will sail in, turn, and sweep on the way out. Meanwhile Commodore Keyes, Carden's Chief of Staff, has also taken direct command of the minesweepers, and to encourage them to perservere under fire, he has offered a financial bonus to the civilian crews and proposed to stiffen the crews with young officers from the fleet. Despite the new tactic, this evening's effort is little more successful than earlier attempts. Though escorted by Canopus and other warships, the minesweepers are under fire as they sail up the straits, and by the time they reach the point to turn and begin to sweep, four of the crews are so agitated that they do not extend their equipment. Two trawlers manage to sweep two mines, but the other strikes a mine and sinks. Though the crew is saved, the loss serves only to inspire the shore defences to pour more fire on the ships. With two of the trawlers damaged by 6-inch shells, the operation is called off and the minesweepers withdraw. - In Germany the Admiralty Staff considers the ammunition situation at the Dardanelles to be dire, and since the prospects of Austro-Hungarian success against Serbia are as remote as ever, they recommend putting severe diplomatic pressure on Romania to allow for the transportation of munitions across its territory. It also recommends that at least one German submarine should be dispatched to the Dardanelles, as the Austro-Hungarians remain unwilling to do so. - The commander of the British force occupying Duala and the surrounding region in German Kamerun is informed by London today that no further reinforcements should be expected and that his priority is defending his current positions, as opposed to undertaking offensive operations. This is effectively a restatement of the original British aim in its campaign against German Kamerun - namely, that the priority is the conquest of the coast and the denial of ports to German raiders. - After two months of moving between fjords on the southern Pacific coast of Chile, the German light cruiser Dresden has slowly been making its way up the Chilean coast since mid-February, staying out to sea to avoid detection. Two days ago, it was sighted by the British armoured cruiser Kent, and though it used its superior speed to escape, it used most of its remaining coal to do so. Since yesterday Dresden has been anchored in Cumberland Bay on the Chilean island of Más á Tierra, waiting for the arrival of its collier. Today the Chilean governor insists that in accordance with maritime law, Dresden has used up its alloted twenty-four hours in neutral waters and must depart immediately, but the German captain insists that his engines require repairs, which would provide legal justification to prolong his warship's stay. While this dispute is played out, Dresden's wireless signal to its collier has been intercepted by the British, and both Kent and the light cruiser Glasgow are en route to Cumberland Bay.